Development of various transfer plants. Juan Antonio Sánchez Quero, President of the DPZ (DPZ; Provincial Council of Zaragoza), presented information to over 300 mayors and officials of the province on 20th June 2017, detailing the ‘ecoprovincia’ integral waste service project, which will create new transfer plants and vehicles for waste transport. The project will mean that municipalities in the province of Zaragoza meet the Law 22/2011 on Contaminated Waste and Soils, which requires them to treat and recycle at least 50% of waste generated in the area. The project will entail a comprehensive waste collection and recycling service, which has a budget of €6 million; €4 million of which will be used for the construction of six transfer plants distributed in the province, while the remaining €2 million will be used to purchase the transport vehicles, which will be responsible for transferring waste from the transfer plants to the eco-landfill on a daily basis. The project will now need to be approved by the provincial corporation. Along with in-depth project details, you can also access the contact information for some of the key decision-makers on the project. To take a look for yourself, click here. Upgrading and extension of a mechanical biological treatment plant. Waste Treatment Technologies (WTT) has announced that it will be upgrading facilities at Kompostwerk Olpe (Olper Entsorgungszentrum), a mechanical biological treatment (MBT) plant, as well as adding an extension to the current mechanical line. The announcement, which was made 8th June 2017, will see WTT design, deliver, install and start-up the upgrade/extension, which is scheduled to begin at the end of June. New equipment will include: NIR separator, conveyor belts, steel construction and control cabinet, including SCADA. This upgrade/extension will allow black and dark coloured plastic components in structure materials to be detected and reduced. Kompostwerk Olpe has been in operation since 2015 and WTT already has a maintenance/support contract with Kompostwerk Olpe. The plant initially dealt with the composting of various biowastes and operated the landfill of Olpe County. However, more recently, work at the MBT plant has been concentrated on post-production landfill activities, in particular the collection and utilisation of landfill gas. A tender has been issued for the expansion of a biogas plant in Mallorca. Tirme, which is responsible for urban waste management on the island, is planning to add a new anaerobic digester to process the wet form of organic fraction from selective collection. It is hoped that the added plant will increase existing treatment capacity from 32,000 to 63,000 tonnes per annum. To keep up-to-date with this project, click here. ENGIE Switzerland and Elektrizitatswerk der Stadt Zurich are planning to replace the existing facility in the Sisslerfeld industrial area with a wood-fired power plant. Once complete (scheduled for the end of 2018) the plant will provide around 17,500 households with CO2-neutral, green electricity. Fortum Värme, who operate a combined heat and power (CHP) plant for waste incineration in Stockholm, are looking to acquire a 54 MW grate-fired boiler plant for any untreated waste. The deadline for tenders is 8th August 2017. Currently, the plant has six boilers; of which, four incinerate municipal solid waste. Of the remaining two, one is fired on industrial waste and the other bio-oil. Elecnor has announced that it has been awarded the contract for the engineering, procurement and construction of two new biomass plants in Fundão and Viseu. Construction has already begun and is expected to be completed in the first half of 2019. Energy produced from the processing of forestry biomass at the plants will be fed into the national power grid. The full details behind this project are now available to access in full for the next 7 days. To make sure you don’t miss out, click here. Next up in our series of Global Waste Investment Fact Files is the Malaysia edition. As of April 2017, AcuComm was listing 13 waste projects in the country, with a total value of US$1,128 million, or US$87 million each. Incineration (with energy recovery) is the leading project type, accounting for US$712 million or 63% of the total. This is followed by integrated/mixed facilities, accounting for US$296 million or 26% of the total. The total estimated capacity of these projects is 2.5 million tonnes. This is equal to 192,207 tonnes per project on average. This capacity is equal to 26% of Malaysia’s estimated annual waste generation, at 9.6 million tonnes. Waste investments totalling US$1,080 million are expected to become operational over the next few years. This is currently expected to peak in 2018 at US$363 million. Alternatively, you can take a look at all of the Malaysian projects in our database by clicking here. Svensk Kärnbränslehantering (SKB) is planning to build a new nuclear waste encapsulation plant and expand an existing spent fuel repository (SFR) in the Oskarshamn and Forsmark areas. The company has applied for a building permit for the encapsulation plant and is awaiting for this to be appraised. Sweco has been commissioned for the plant’s plan, design and technical building services, among other things, in a contract that could surpass the SEK 200 million mark. In the week ended 23rd June 2017, AcuComm added 45 new or updated projects to our Business db, worth an estimated US$3,522 million and feedstock capacity of just over 11.3 million tonnes. 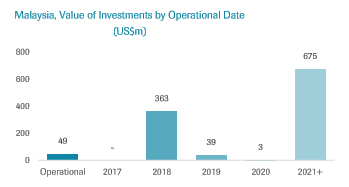 This takes the total estimated value of projects to US$376.1 billion. MSW was the leading feedstock type reported on in the past week, accounting for an estimated 5.8 million tonnes, or 51.6% of the total. 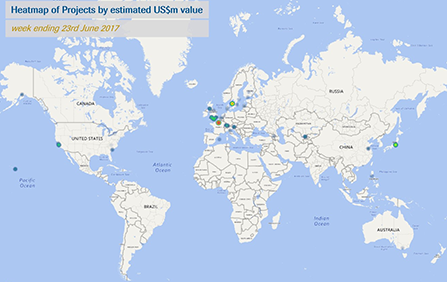 The leading country in the past week was the USA, with ten projects reported on. This was followed by the UK with eight and Sweden with three. With access to AcuComm’s proprietary database, Business db, the Sales Package is a must-have for companies looking to engage with the Waste, Bioenergy and Recycling sectors. Along with full project overviews, your sales team will have access to the direct contact details for key decision-makers involved with each. To take a look to see how it could benefit you, click here. Last month, the Bruhat Bengaluru Mahanagara Palike (BBMP) invited tenders for the construction of a new waste-to-energy plant in Karnataka. It will have a throughput of 500 tonnes of refuse-derived fuel (RDF) per day, generating 40 MW of electricity. Comox Strathcona Waste Management (CSWM) has issued a Request for Information (RFI) with the hope that qualified waste-to-energy technology vendors will be interested in participating in a feasibility study for managing municipal solid waste. The costs of landfilling are high, so the company is keen to see whether there are financial, social and environmental benefits of apply WtE technologies instead. The Asian Development Bank (ADB) is helping Uzbekistan improve its solid waste management in Tashkent. Under the project, investment will be made to accelerate waste minimisation and recycling initiatives, as well as upgrade the waste collection and transfer systems. This week, the ADB issue a tender for design supervision consultants of a new sanitary landfill that will be developed. The stand-alone facility is designed to be self-sustainable. This project is now available to access in full for the next 7 days. To make sure you don’t miss out, click here.